While humans have verbal speech and a written alphabet in various languages to communicate with one another, cats have only vocalization and body language to communicate with us. Most of the time, we do not understand either. The most obvious way that cats communicate to us is through vocalization. Probably the most thought of way cats vocalize is by meowing. Cats have various meows for different needs. A short, sweet mew could be a “hello.” A loud, demanding meow indicates a need, whether it be food, water, affection, or otherwise. 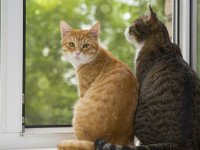 Other ways that cats communicate is through body language. Along with the ears turning everywhere to listen, they are a good way to tell a cat’s mood. If the ears are straight forward, the cat is probably alert and happy. If the ears are flat back against the head, the cat is frightened or becoming aggressive. Cats pull their ears back when they get aggressive so that they won’t be injured if a fight occurs. The eyes also can tell what mood a cat is in. Taking into consideration the constricting and dilating of the pupils in different light intensities, they also change with their moods. A cat that has constricted pupils is normally happy or content, while a cat with dilated pupils is scared or aggressive. Half closed eyes also indicate contentment or lethargy. Another small way of trying to read a cat is by looking at the whiskers. Whiskers that are pointed forward are content or happy; they are pulled back against the face when the cat is scared or shy. Along with all these ways of telling if a cat is happy or unhappy, owners can also tell if their cat loves them. If a cat licks his owner, he is telling him that he loves his owner. He grooms his owner as the way that cats groom each other affectionately. Although this seems strange, cats will “knead” their owner to express their love for him. As the owner is a mother figure, cats who love their owners will knead them as a kitten kneads its mother to get milk from her. One last way that a cat shows his love, is by rolling over on his back when he sees his owner. This shows trust by putting the cat in his most vulnerable position. He is showing his owner that he knows his owner would not hurt him. Most times, contrary to popular belief, this is not an invitation to rub his belly. That normally requires a much higher level of trust. Cat Doors: Choose the perfect one!